Morocco’s Arab Spring was short lived. The protest movement that emerged was somewhat pacified by the State with promises of reform and initiatives to tackle corruption and improve human rights. A new constitution was passed. These promises were mainly empty rhetoric and voices of dissent continue, and continue to be suppressed by the authorities. It’s estimated that around 300 are currently in Morocco’s prisons for voicing opposition to the regime. Over the past three years activists from the 20 February Movement, a youth-led pro-democracy movement which emerged in Morocco as part of the regional uprisings, have been subject to arbitrary arrests, torture and even murdered by the State. But the movement was not silenced. On 6 April 2014, thousands of Moroccans took to the streets during a demonstration organized by the three main trade unions. The demonstration had been given permission by the authorities to take place. The protest was held to call for increases in pay and pensions, the right to labor organization and the right to strike. Student groups also joined the protest to highlight social and economic concerns affecting youth and to call for the release of detainees. During the demonstration eleven protesters from 20 February Movement were detained and beaten by police. They include Ayoub Boudad (known as Simpson), Hakkim Serroukh, Mohamed Alharaq, Hamza Haddi, Mostafa Aarass, Amine Lekbabi, Fouad Elbaz and Youssef Bouhlal. The protesters were accused of “assaulting a police officer”, “chanting anti-monarchy slogans” and “participating in a non-authorized demonstration”. The arrests were a politically motivated attempt to silence the 20 February Movement. On 22 May 2014, the activists were sentenced to up to one year in prison. To hear a Moroccan activist’s voice on political arrests see video here. 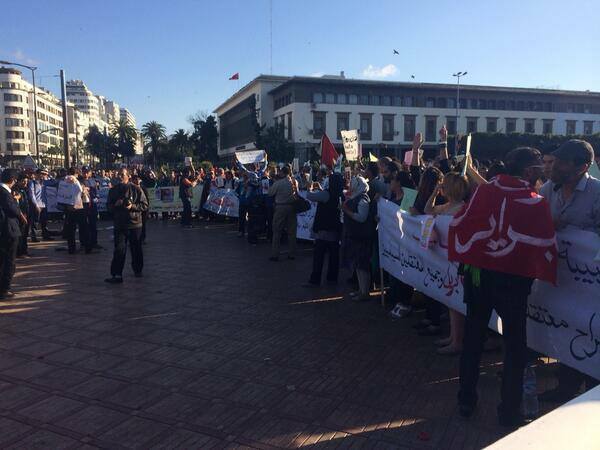 Solidarity actions with the detainees have been held in Casablanca, Rabat, Mohammedia, Tangier and elsewhere. Some were violently dispersed by the cops such as one that occurred in Beni Mellal on 1 June 2014; five protesters were hospitalized. The State has also detained Morocco’s revolutionary rapper Mou’ad Belghouat (known as El Haqed/ L7a9ed). He was beaten by cops on 18 May 2014 outside a football stadium in Casablanca and arrested on trumped up charges of dealing tickets on the black market. Through his music El Haqed spoke of government corruption, social injustice and police brutality. He’s been a constant critic of the State. On 5 June a trail accusing him of public drunkenness and assaulting a police officer was adjourned for the fourth time. It’s the third time he’s been arrested in three years. In 2011 he was detained following a fight with a royalist and in 2012 he was sentenced to one year in prison for “threatening national security” following the release of his song “Kelb al-Dawla” (Dogs of the State) which highlights police corruption. High in the Atlas Mountains another largely invisible struggle is taking place. The Amazigh community in Imider have been protesting against a silver mine by Imiter Mettalurgic Company (SMI), a company owned by the monarchy. The mine has been responsible for depleting water resources and causing pollution through the release of cyanide and mercury into the environment which has led to contaminated water and the death of livestock. Despite being one of the largest silver mines in Africa, the presence of the mine has failed to improve living conditions in the area. Imider is one of the poorest communities in Morocco; there are no proper schools or hospitals and most homes don’t have electricity. A protest movement emerged in August 2011 called The Movement on the Road ’96. It takes its name from an uprising in 1996 against the mine where a sit-in was brutally repressed by the authorities. The aim of the movement is to hold SMI responsible for environmental damage and also demand that 75 per cent of jobs allocated by the mine are given to the community. They also draw attention to wider issues of discrimination and marginalization faced by Morocco’s Amazigh community. For a video of the protest movement see here. In 2011 activists from the movement carried out an action cutting off a pipe valve to stop water supply to the mine. They also occupied the area around the mine to prevent the reopening of the valve (an occupation which continues till today) and they hold regular protests. A number of Imider activists have been arrested since 2011 and the State has recently increased its oppression against the movement. On 1 March 2014 three activists, Omar Maujane, Abdesamad Madri and Brahim El-Hamdaoui were arrested whilst traveling in a car with relatives by members of the Royal Gendarmerie disguised in civilian clothes. During the arrest they were beaten and verbally abused which resulted in a sister of one of the activists having her arm broken and a mother of one of the activists losing consciousness. They were sentenced to 3 years in prison in March 2014. But the community has not been silenced. Protests have been organized calling for the release of political prisoners of the Imider struggle and denouncing the arbitrary arrests of activists. Freedom for all the detainees! Posted on June 14, 2014, in North Africa and tagged Morocco, Prisoners' Struggle. Bookmark the permalink. Leave a comment.